Perhaps a more schematic, colour-coded version might help? The floor you've drawn is more like the orange floor in the diagram, it doesn't match the perspective of the character. I feel the floor and drop shadow weaken the presentation though, because they imply a perspective different from the perspective on the mech. Look at the apparent perspectives. The horizon line for the mech is somewhere near the head (and the focal length is very long), while the horizon line for the floor is way higher (and the focal length is shorter). 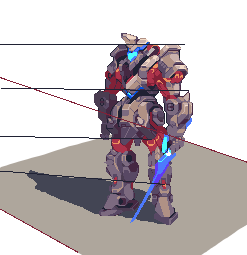 Similarly, the shadow seems to have a much higher horizon line than the mech. It looks cool that the floor is rotated relative to the mech, but if it's horizontal as the mech's feet positioning would imply, then it should obey the same horizon line as the mech, its lines would just converge on a different point on that same horizon. Same for the shadow, which is essentially a flat projection on that floor. Damn, this is just impressive. I really enjoy your mechs, they've got just enough bulk to truly look their size and weight while still being elegant and sleek.